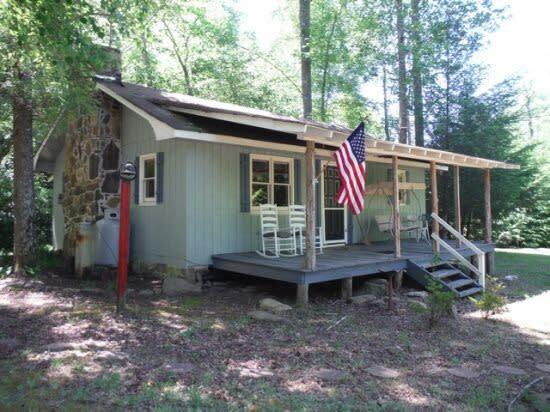 "Grandpa's Cabin" has plenty of rustic appeal including a covered front porch and bold Cedar Creek in the front yard. In the evenings you may enjoy sitting on the front porch with your family (four-legged family members welcome) and listening to the rushing water just steps away. There are rocking chairs and a porch swing for your use. This is the perfect spot for your morning coffee or tea. You and your children may want to jump into the creek to play or just to cool off! 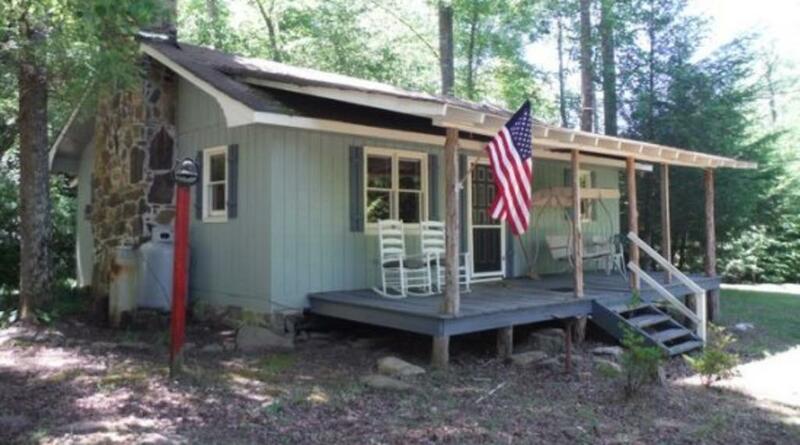 Basic but Functional This single-level cottage has 2 bedrooms and 1 bathroom. It was built years ago as a family getaway in the country, on a substantial lot that includes private hiking trails. It is basic but functional, offering a true escape from the modern, hectic world. The living, kitchen, and dining areas are in a single large room that includes a great stone fireplace with gas logs. It is perfect for cool evenings, when a blazing fire in a mountain cabin is ideal. For All Seasons With the area's temperate climate and beauty, this home can be enjoyed throughout the year. Springtime brings the blooming of the dogwood and red bud trees as well as the azaleas, rhododendron, and mountain laurel. Summer brings lush greenery and the autumn colors are extraordinary. Winters are mild and, with less tree obstruction, views are incredible. Add the year-round sounds of Cedar Creek and you have peaceful perfection!